If you happen to be a ghost hunter and you’re in Japan for the summer, there’s no need to worry about job security. Summer is Japan’s ghost season, and the month of August is when it peaks. August is the month of the traditional Buddhist Obon festival. During this time, ancestral spirits return home for their annual visit from the netherworld to dance and celebrate, and families reunite in their hometowns to greet them and join in on the festivities. Even though it’s still 2 months from Halloween, the ghost season has already started in Japan, and with so much paranormal activity going on, you’ve got to be ready. In this article, I’m gong to layout the basics of Japanese ghosts so you can be prepared for your next encounter with a supernatural (and possibly vengeful) spirit. 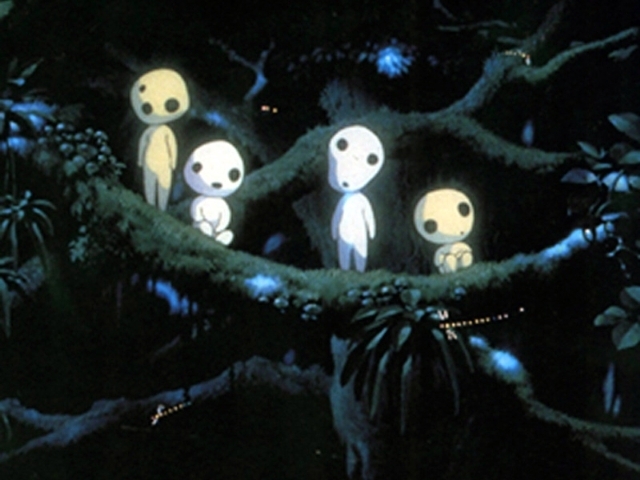 Kodama are harmless spirits who inhabit trees. The word for ghost in Japanese, yuurei 幽霊（ゆうれい）, roughly translates into “dim spirit” or “faint soul.” It’s believed that stories of the supernatural were commonly shared in Japan even before documentation. The country is inundated with spine-chilling tales. While many Western religions believe in the existence of one, supreme deity, the ancient Japanese believed in omnipresent divinity. This included the idea that humans can transform into supernatural beings after death. So, while Western ghosts may be thought of as the shadow of one’s self, yuurei were believed to be like gods. The humanoid form of a Kodama – a godlike spirit. However, as the religious beliefs of Japan began to change, so did the ideas around the status of the human soul after death. With the spread of Buddhism, yuurei slowly became the manifestations of vengeful souls. 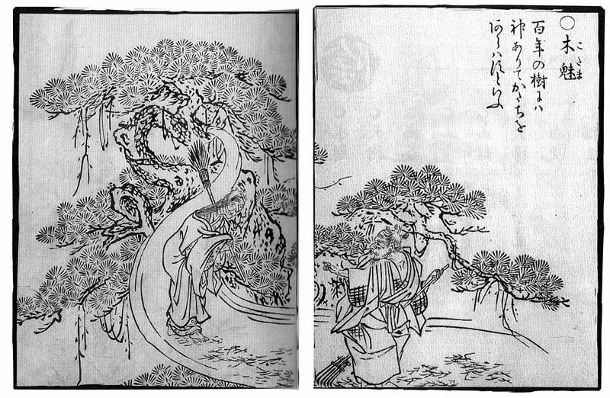 The introduction of the concepts of heaven and hell, supernatural beasts, and reincarnation in Buddhism completely changed the face of the Japanese yuurei. Rumors of apparitions became more and more exaggerated and prevalent, inspiring a ghost story renaissance. According to the Japanese beliefs of this era, every human possesses a reikon, or a soul. After a person dies, their soul goes through a form of purgatory where it waits to be released to its ancestors by means of a traditional Buddhist funeral ceremony. If all goes right, the person’s soul becomes a loving protector of the living family. However, if the person dies in an sudden, unnatural manner, whether it be by suicide or murder, or if the proper burial ceremony is not preformed, the person is said to transform into a yuure_i – a being which has the power to bridge the supernatural world and the physical world. A person may also become a _yuurei if they are weighed down by overwhelming negative emotions such as hate, sorrow, or vengeance in their life, and that’s when things start to get scary. Onryō: Vengeful ghosts who were wrong during their lifetimes and come back from purgatory for some pay back. 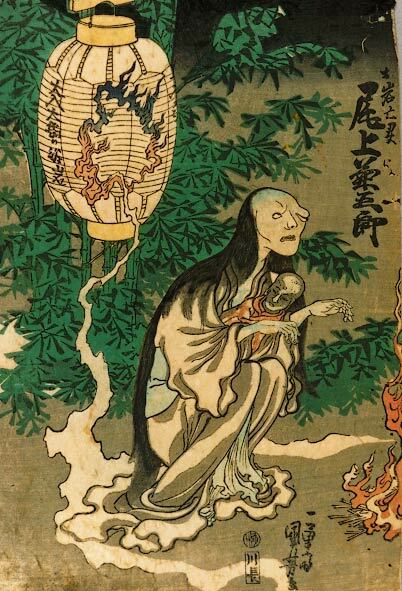 Ubume: The ghost of a mother who died in childbirth, or died leaving her children behind. Instead of bringing wrath, this yuurei brings sweets and longs to take care of her children. Goryō: Ghosts of the aristocratic class, especially those who were martyred. Goryō are also mainly interested in vengeance. Funayūrei: The ghosts of those who died at sea. These ghosts are said to have a scaly complexion – some might even resemble mermaids. Is the Little Mermaid a ghost? Must be. Zashiki-warashi: The ghosts of children. These guys are often more mischievous than dangerous (like Peeves from Harry Potter). Samurai Ghosts: The ghosts of soldiers who fell in battle, especially the Genpei war. Unlike most other yuurei, these ghosts usually have legs and are almost exclusively shown in Noh theater. Seductress Ghosts: The ghost of a vengeful man or woman who comes back to start a post-death love affair with a human (as seen in Botan Dōrō). One of the most famous ghost stories, or kaidan, in Japanese history is known as Yotsuya Kaidan. In this tale of revenge, a husband poisons his wife, Oiwa, out of longing to marry an affluent neighbor. Oiwa’s hair falls out, her face becomes disfigured, and she eventually dies, but not without coming back for revenge on her unsuspecting husband. This eerie tale has been revived countless times in the theater and has become a timeless classic. Now that you know the different kinds of yuurei, let’s take a look at how to identify them. 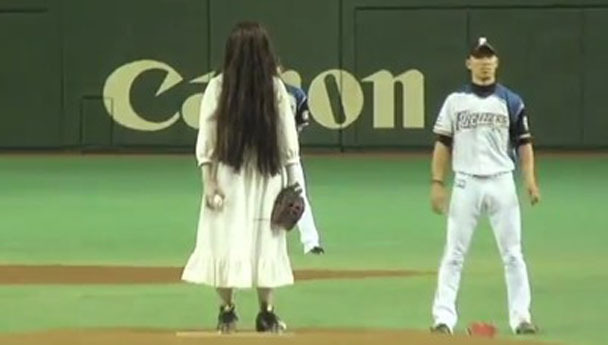 And it looks like we’ve got a ghost in the pitching position today. 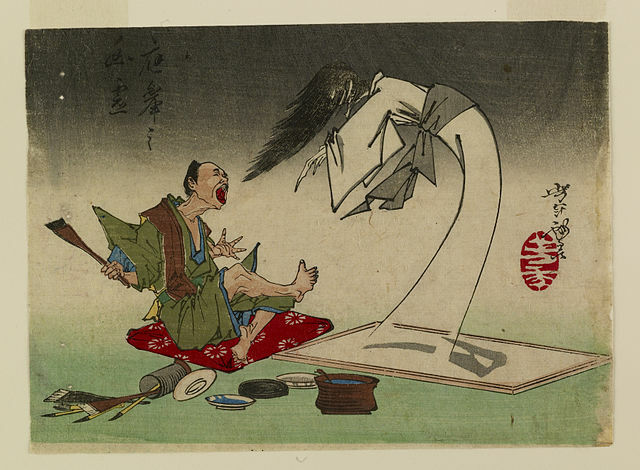 The Japanese tradition of telling ghost stories hit its peak in the Edo era (1600-1868). Many ghost stories came from the Bunka-Bunsei period in the early 19th century, an era of creative decadence, as it became a traditional way to pass the hours on hot summer nights. Ghosts usually are depicted in white – a symbol of the white kimonos used in Edo era burial practices. White also happens to be the color of ritual purity in Shinto and was reserved for priests and the dead. Japanese ghosts might also have a white, triangular piece of fabric on their heads called a hitaikakushi. This is one of the most obvious trademarks of a Japanese ghost. A yuurei's hair is usually long, black and disheveled. Traditionally Japanese women grew their hair out long and wore it up, but it was let down for a funeral ritual. Even in modern times ghosts are said to have this type of hair, and sometimes it even attacks! Another feature of yuurei is that they have no feet. Instead of walking, they drift about supernaturally, arms extended and wrists limp (almost like a zombie). This image was first depict in Edo era Ukiyo-e prints and later adopted in kabuki theater. Actors would either wear long kimonos or be lifted into the air by a system of pulleys. I shouldn’t have to say this, but if someone is coming toward you in the dead of night and you notice they are lacking the appendages to do so with, you should be very skeptical. Yuurei are often shown with a pair of floating flames or will o’ the wisps (hitodama) in colors such as blue, green, or purple. These flames look like little ghost friends, but they are actually separate parts of the spirit. Although the concept of ghosts took a major turn with the introduction of Buddhism in Japan hundreds of years ago, most aspects of traditional ghost stories have stood the test of time. Even the ghost in “The Ring” looks like an accurate depiction of a traditional Japanese ghost. Even so, the motivation for haunting and the appearance of ghosts has changed slightly at times as new issues have arisen with globalization and modernization. During World War II rumors of ghost soldiers could be heard about, and terrifying tales of radiated souls roaming the land weren’t uncommon. These days ghost stories are often motivated by contemporary problems, such as violent incidents of suicide and murder in Japan. Another common theme is technology, as can be seen in “The Ring.” In general, ghosts have become more violent. The general rule of thumb these days is: the bloodier, the better. If buckets of blood aren’t involved, ghosts just aren’t scary it seems. More violence! In short, ghosts keep getting scarier and scarier, and I don’t know about you, but that means I want them around less and less. This calls for an exorcism lesson. So you’re in Japan and Hanako-chan won’t leave you alone in the toilet – what are you going to do? 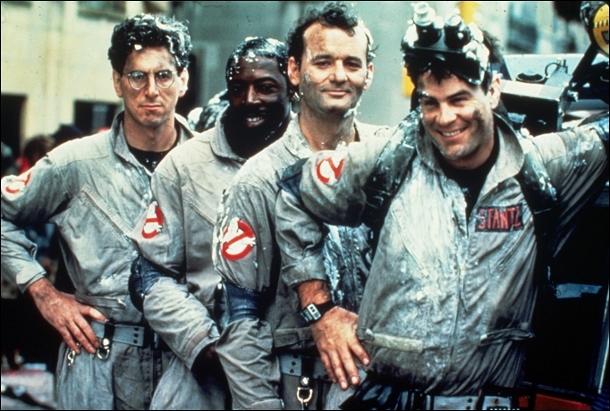 Call the Ghost Busters? I don’t think they fly internationally. Whip out the good ‘ol holy water and crucifix? Sorry, that doesn’t work in Japan. 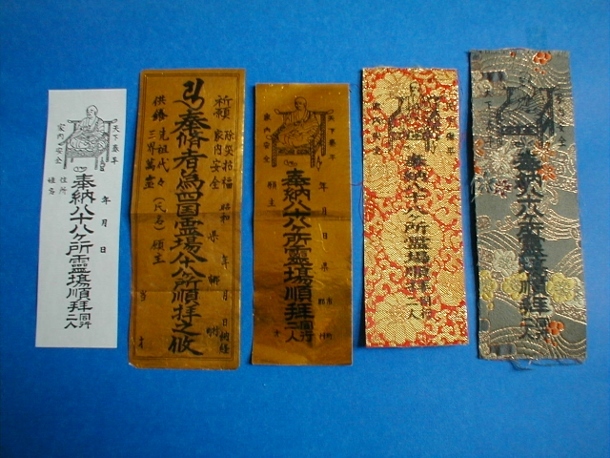 Traditionally, the best way to keep a ghost at bay is with ofuda, or strips inscribed with Buddhist sutras, which are believed to chase evil spirits away. There are also some Shinto shrines that can perform purification rituals called ofurai that have the power to rid you of any bad omens. But let’s be serious, people don’t believe in purification rituals anymore, and more effective methods have been discovered. 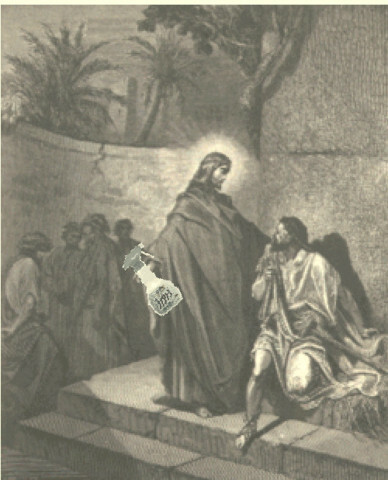 A hot topic in Japan recently is the exorcising powers of Febreze. Yup, that’s right. You know that stuff your mom uses to keep the pizza roll odors fuming from your brother’s room at bay? That very same stuff can send a ghost straight into the netherworld, wishing it never decided to step foot back on Earth. No wonder it smells so fresh. Febreze. Freshen the Air, Refresh Fabrics, Exorcise Linda Blair. Don’t believe me? Try it out yourself. For only 1,980 yen, you can buy a Baketan 2, a ghost detector from Tokyo-based Solid Alliance Corp., find a ghost, and let them have it. No more worries about ghosts, spirits, or whatever you may call them.